Strong themes of isolation and entrapment are woven into BOOM! Studios magnificent horror comic. The creative team manipulate the the narrative and the art to make sure that the readers remain in a constant fear for the characters well being. The Empty Man #4 continues to explore the horrors of a virus spreading fear and violence throughout America. While uncertainty grips the real world, this comic from BOOM! Studios gives fear a physical form and releases it upon the innocent and guilty alike. No-one is safe which is the major theme explored within this horror series. The Empty Man virus is spreading and taking new form. This issue opens in a film studio where two young children are being interviewed for a news show. The reporter is curious about the children and their link to the Empty Man virus. As a contrast, the two children are dismissive of the reporter; they have a greater understanding of what is happening and display impatience for the uninitiated. Cullen Bunn manages to kick this issue off with an extremely creepy sequence despite the fact it lacks the horror and the gore present in much of what follows. The intensiveness of the two children during the interview and their attitude towards the reporter is extremely unnerving. Bunn gives them voices more suited to a religious or cult leader. As a result their dialogue is uncomfortable to read. They have a steady and matter of fact tone. What they say isn’t just a story they have made up but a Truth that they believe in entirely and this comes across in the way that Bunn has scripted the scene. After the opening scene the reader is thrown right back into the action from the previous issue where a family and their protectors are trying to escape the neighbour. 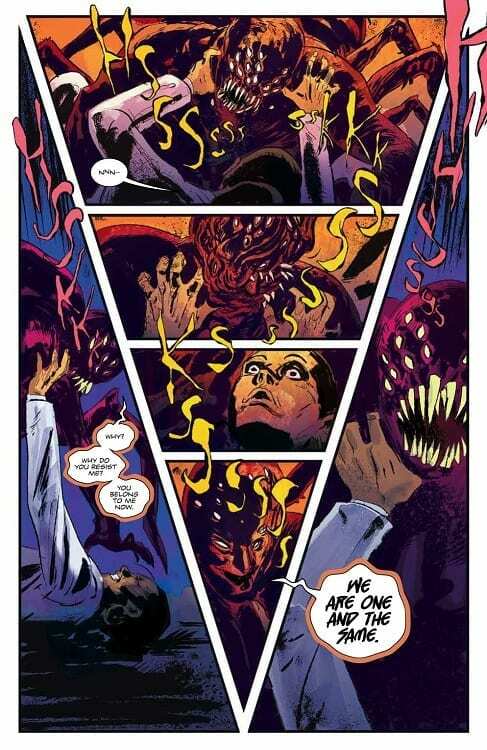 So far it has played out like a scene from a Purge movie but for this issue Bunn throws a curveball into field: large spider like mutations which appear to be the next stage of the Empty Man virus. First infection, then invasion. Bunn follows the corruption of the innocent with the fears of adulthood. He continues to punish the FBI agents and the family by making their night go from bad to worse. Even after their apparent escape Bunn reminds the reader of the cost so far and hints at the terrors that are to come. There are elements of this comic which may not make sense at first as they relate to previous issues and even the previous Empty Man series. However, Bunn has woven a short flashback sequence into the narrative to bring everyone up to speed. The bonus of this two-page spread is that it fits snuggly within the story and doesn’t feel like an info-dump just for the sake of it. 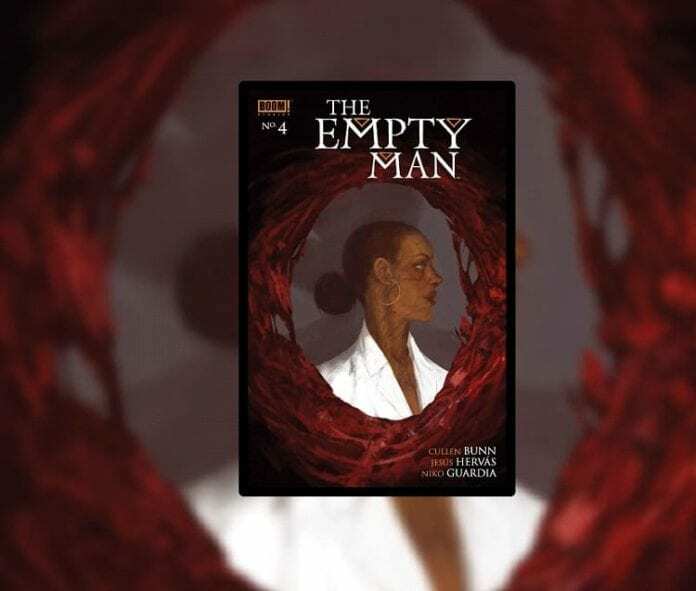 It is a moment that makes narrative sense within this issue of The Empty Man. The difficult job of visualising the horrors in The Empty Man falls to Jesus Hervas. Luckily for all concerned Hervas can manipulate the images within the panel to create the necessary tone. Even in the opening sequence which is bathed in bright light and reassuring color, all provided by Niko Guardia, Hervas uses the facial expressions of the characters to reflect the deeper, unnerving elements of the script. The young boy and girl have an innocence about them which is somewhat belittled by their eyes and the words they are speaking. Hervas creates a contradiction between the art and the speech which results in the uncomfortable feeling emanating from the page. To contrast this, Hervas draws the reporter with a straight face throughout. By the end he becomes a man out of his depth illustrated by the fact that the children begin to surround him in the panels; he becomes trapped. As this issue continues, that feeling of being trapped is returned to again and again, like a running theme for the central characters. Several pages have the characters imprisoned within the panels either surrounded by other characters or boxed in by scenery or the panel boarders themselves. One of the highlights of The Empty Man is the lettering work by Ed Dukeshire. Not only can he reflect emotion through the speech balloons but his sound effects strike fear into the hearts of the reader. Whether it’s the chaotic gun shots or the screeching creatures, the sound effects seem to tear across the page and bleed out of the comic itself. As The Empty Man progresses it becomes more unnerving and grotesque. 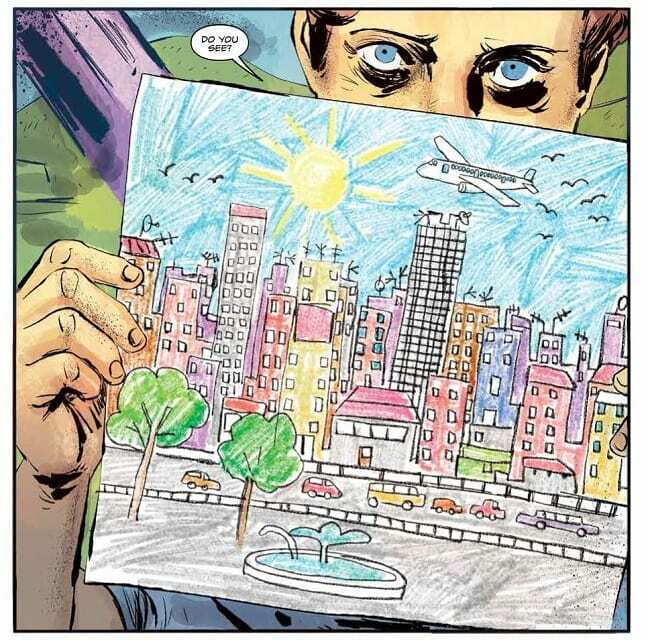 The theme of entrapment, physical and emotional, which runs through this issue gives it an additional horrific edge. Bunn understands the horror genre and demonstrates that knowledge on every page of this comic. In turn, the creative team of Hervas, Guardia and Dukeshire visualise the emotional terror of the characters through dark yet expressive panels. No two page is the same with the layouts changing to best express the elements on each particular page. There are other horror comics on the shelf but with The Empty Man, BOOM! Studios have a visually disturbing and visceral tale of terror which is really beginning to pick up pace.